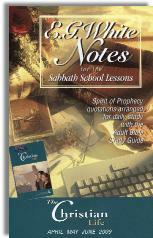 A couple of sections are quoted from the book; Steps to Christ, then a review of the week in the form of four discussion questions are presented. These discussion questions are concerned with such topics as; quality of life for the terminally ill, the meaning and purpose of life for those who are about to die, the detrimental effects of our contemporary culture and moral values, and the importance of the Adventist health message. Only the Bible can give valid answers to these questions. Asking a person what they think is OK but our responses should be rooted in the Word of God. Each of us should know what the Bible actually says on any given topic when we express what we think.Today's lesson is totally barren of any quotes or direct reference to Scripture. It is critically important to support what we think based upon what God says in the Bible. By not directing attention to Scripture or encouraging a person to frame their thinking around the Written Word, worldly opinion is given just as much justification as God's eternal truth. That will only lead to confusion, sickness and death. We need to be reminded that Satan our enemy is always nearby and ready steal, kill and destroy. We can only avoid the trap of his lies if we stay protected in God's word through the indwelling leading and teaching of the Holy Spirit. Finally, my brethren, be strong in the Lord, and in the power of his might. Put on the whole armour of God, that ye may be able to stand against the wiles of the devil. For we wrestle not against flesh and blood, but against principalities, against powers, against the rulers of the darkness of this world, against spiritual wickedness in high places. Wherefore take unto you the whole armour of God, that ye may be able to withstand in the evil day, and having done all, to stand. Stand therefore, having your loins girt about with truth, and having on the breastplate of righteousness; And your feet shod with the preparation of the gospel of peace; Above all, taking the shield of faith, wherewith ye shall be able to quench all the fiery darts of the wicked. And take the helmet of salvation, and the sword of the Spirit, which is the word of God: Praying always with all prayer and supplication in the Spirit, and watching thereunto with all perseverance and supplication for all saints (Eph. 6:10-18 KJV). Scripture warns us about the wiles of the devil and that we need to be protected by putting on the full armour of God. This includes "the sword of the Spirit, which is the word of God". The only person who can avoid the traps of the devil is the one who has a saving belief in the gospel message of Jesus Christ and remembers to put on the full armour of God. 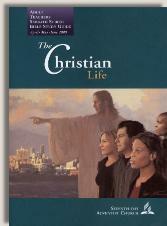 Copyright 2008 BibleStudiesForAdventists.com. All rights reserved. Revised April 11, 2009. This website is published by Life Assurance Ministries, Glendale, Arizona, USA, the publisher of Proclamation! Magazine. Contact email: BibleStudiesForAdventists@gmail.com.